Small yet powerful, Mantis Q features cutting edge, advanced drone features such as voice control and facial detection in an easy-to-use, ultra portable package. Using an integrated camera, the Mantis Q records high resolution photos and videos. Still images with a resolution of 4800×2700 (16:9) or 4160×3120 (4:3) pixels are saved in JPEG or DNG format on the included MicroSD card; the same goes for up to 4K of recorded videos. Vision based tracking and face detection. Simply smile at the drone to activate face detection and as soon as the Mantis Q “sees” the user’s face, it will take a photo from up to 13 feet away. In Gesture Control mode, Mantis Q will detect a hand waving and it will take a photo. “Mantis, take a selfie!” – With the all new Voice Control feature, users can command Mantis Q just by using their voice. Voice control allows users to take a photo or begin recording video all without having to manually take their hands off of the controls, making it that much easier to capture the perfect shot. Mantis Q responds to commands such as “Wake up” for powering on, “Take a picture”, “Record a video” and “Take a selfie”. Intelligent flight modes -Take your creativity to the next level by letting Mantis Q focus on the flying while you focus on the shot. Your adventure awaits. Mantis is ready. 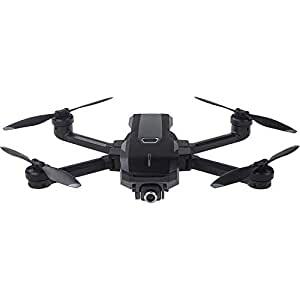 Small yet powerful, Mantis Q features cutting edge, advanced drone features such as voice control and facial detection in an easy-to-use, ultra portable package. Thanks to its energy-efficient design, the drone can stay in the air for a category-leading 33 minutes, allowing pilots plenty of time to record great photos and video clips. When folded together, the Mantis is small enough to tuck in a bag and weighs just 1 pound. It’s the ideal companion for big and small adventures alike. Capture your memories in 4K UHD Using an integrated camera, the Mantis Q records high resolution photos and videos. Still images with a resolution of 4800×2700 (16:9) or 4160×3120 (4:3) pixels are saved in JPEG or DNG format on the included MicroSD card; the same goes for up to 4K of recorded videos. Additionally, the camera can be tilted upwards by up to 20 degrees or downwards by 90 degrees during flight. For cinematic camera flights, the Mantis Q also comes with automatic flight modes such as Journey, Point of Interest and Orbit Me. Vision based tracking and face detection Simply smile at the drone to activate face detection and as soon as the Mantis Q “sees” the user’s face, it will take a photo from up to 13 feet away. In Gesture Control mode, Mantis Q will detect a hand waving and it will take a photo. “Mantis, take a selfie!” With the all new Voice Control feature, users can command Mantis Q just by using their voice. Voice control allows users to take a photo or begin recording video all without having to manually take their hands off of the controls, making it that much easier to capture the perfect shot. Mantis Q responds to commands such as “Wake up” for powering on, “Take a picture”, “Record a video” and “Take a selfie”. Intelligent flight modes Take your creativity to the next level by letting Mantis Q focus on the flying while you focus on the shot.